National Forum’s John Clymer (2nd from left) spoke at November 9, 2017 Congressional Briefing on the Diabetes-Cardiovascular Disease Connection. Other speakers included (L-R) Omar Lattouf, Emory Univ. ; Anne Dalin, patient; Ann Fornburger, National Assn. of Chronic Disease Directors. Many people don’t know that a person with type-II diabetes is more than twice as likely to have heart disease or stroke, and die more than seven years prematurely. 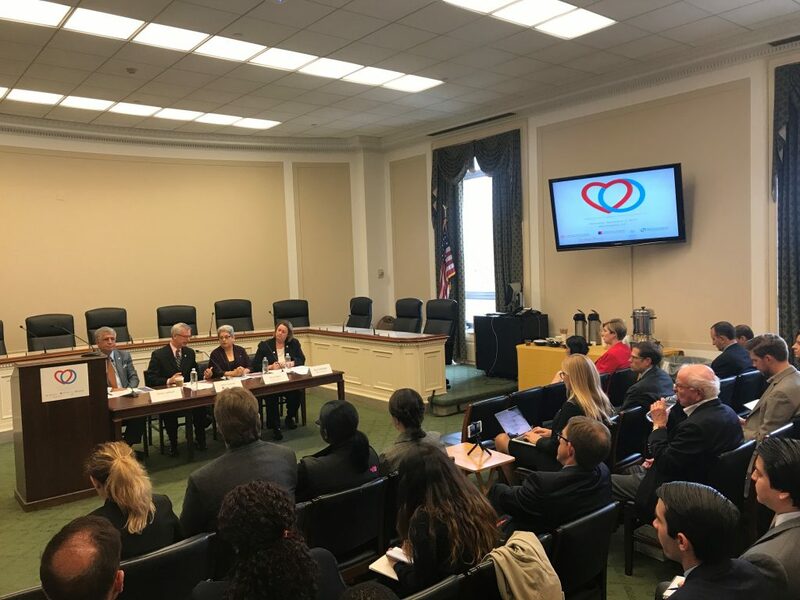 To raise awareness, the Partnership to Fight Chronic Disease hosted a Congressional briefing on November 9, the first National Diabetes-Heart Connection Day. PFCD executive director Ken Thorpe asked me about trends in cardiovascular disease, the diabetes connection, and what can be done to shrink the burden of these diseases. KT: The National Forum for Heart Disease & Stroke Prevention recently released a study that showed a disturbing trend. After years of seeing death rates from cardiovascular disease decline, that trend reversed. What did the study find, and how has diabetes contributed to the reversal? JC: The report, called Wrong Direction, says we are losing momentum in the fight against cardiovascular disease. After steady declines in the death rate from heart disease and stroke, progress decelerated beginning in 2011 and then in 2015, we actually saw an increase in the death rate for the first time in 22 years. These trends are similar for men and women and all races and ethnicities, although the death rate for African Americans/blacks is 30% higher than for non-Hispanic whites. KT: Obesity is a major risk factor associated with both diabetes and cardiovascular disease. CDC released data recently that showed adult obesity rates are now at 40% — 4 in 10 adults in the US are obese. How is that factoring into the rising rates of both diabetes and cardiovascular disease? JC: As you point out, having diabetes greatly increases one’s chances of having heart disease or a stroke. Public health has made huge advances in preventing cardiovascular disease, for example, by decreasing smoking from 25% to 15% of the population in the last 20 years. And by improving blood pressure and cholesterol control. However, these gains have been offset by the rise in obesity and diabetes. The author of our report, Dr. Stephen Sidney, one of the world’s foremost cardiovascular epidemiologists, believes the reversal of our progress may be due primarily to obesity and diabetes. KT: So, we have both a problem with rises in the risk factors for diabetes and cardiovascular disease which means more people affected and we have millions already affected by diabetes and unaware of their risks. Is there some good news? How can we make a dent? JC: First, we have tremendous upside potential. According to the CDC, at least 200,000 deaths from heart disease and stroke each year are preventable. And while improvements in treatment have increased stroke survival rates, I think most people would rather keep their car’s brakes in good working order than to have them fail and survive a crash. Second, we must improve detection of diabetes, smoking, and high cholesterol and blood pressure, and help people bring those risk factors under control. Third, we need to make more movement part of everyone’s everyday life. This involves designing the places we live, learn, earn, pray and play so that they encourage physical activity and, at a minimum, remove barriers to active lifestyles. KT: What can Congress do to move the needle in the positive direction? JC: One big opportunity is to tear down barriers to team-based care. The Community Guide—the Gold Standard of evidence-based prevention—has strong evidence that team-based care including community health workers improves health outcomes and is cost-effective. It is essential that CDC have sufficient funding to combat diabetes, heart disease, stroke and other chronic diseases. Think about it—we could prevent at least 200,000 premature deaths a year from heart disease and stroke. That’s something we should be investing in, not cutting back.